uh huh hunny thats it! 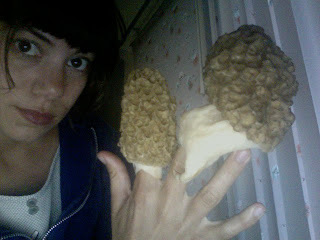 cook em howver, but remember alton brown says dont wash mushrooms if you can help it. ...these in this pic though...only ones i found last year. here's to a forutios plentiful harvest ahead! ..you can always get em round mothers day, two weeks before or after.... and definately much more before if youre living southernly like. Came upon these in dear ypsilanti michigan, ford lake area, toxic dump but yet so pristine feeling. muskrats are there!! my now we should all listen to "toxic", by brittney spears.